Every time we end a float trip at the public river access in Great Cacapon we start dreading dragging our kayaks and canoes up that steep, muddy hill long before our run is finished. Over the years, heavy rains and floods have severely eroded the dirt path down to the river, making getting out of the river extremely difficult—especially with the weak, giggly arms that start to set in after a long paddle! 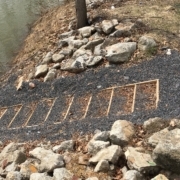 To remedy this slippery situation, the Friends of the Cacapon River has partnered with the West Virginia Department of Natural Resources (DNR) to install wooden steps on the steep slope. This spring, these new steps will be inset into the ground and filled with gravel to improve traction. DNR has also purchased a “mud sprayer” to remove any mud that builds up on the steps after floods. Now you can start planning your float trips without worrying about how you’re going to get your boat up that hill! We love floating on the Cacapon River, and we know you do, too. That’s why we’re working hard this year to make getting on the river easier for our members and the community. If you have any information about other river access put-ins that need improvements, please let us know! Simply email us at info@cacaponriver.org. http://cacaponriver.org/wp-content/uploads/2019/03/Steps-for-River.jpeg 2294 3330 Rachel DAgostino http://cacaponriver.org/wp-content/uploads/2016/01/FOC_Logo_Horz-01-1.jpg Rachel DAgostino2019-03-15 16:55:592019-03-15 16:55:59No More Slippery Slope! Long, stringy, dense, and slimy—there’s not much to like about the massive green algae bloom that’s plaguing the Cacapon River near Yellow Spring in Hampshire County. This overgrowth of stringy algae, known as filamentous algae, stretches for several river miles. In the summer months, the largest patch is 3 miles long and covers up to 80 percent of the river, making swimming, fishing, and paddling nearly impossible. The West Virginia Department of Environmental Protection (WVDEP) recently deemed this algae-affected portion of the Cacapon River to be “recreationally impaired.” For the first time ever, our notoriously healthy river has made WVDEP’s list of impaired streams in the state. 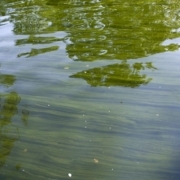 Thankfully, unlike other varieties of algae, filamentous green algae is not toxic to our river’s waters. It’s considered more of a nuisance than a toxin.